Progressive wakesurf boards made with quality and integrity. 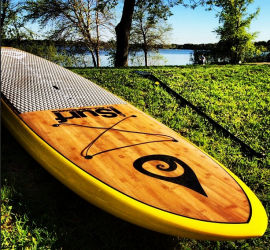 iSurf SUP paddle boards designed by idol surf. Get your new wakesurf or SUP board today! idol surfboards is the world’s premier freshwater surfboard manufacturer, specializing in wakesurf boards and SUP paddle board production. While our roots grow deep in wake surfing, our stand up paddle board brand, iSurf, is regarded as the Mid-West’s original and premier SUP manufacturer. Founded by surfers in Minnesota with a focus on performance and quality, our surfboards offer superior performance, rigid durability, and beautiful finish quality. Please have a look around our online shop, like our Facebook and Instagram pages, and call or email us if you have any questions.